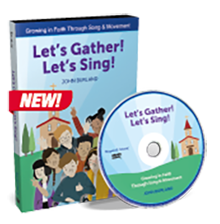 Sing, Learn, and Celebrate, through the new Together in Jesus Sacrament preparation CD collection. 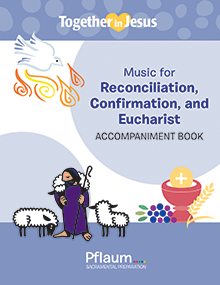 New music collection by teacher/composer, John Burland, for celebrating the Sacraments of Reconciliation, Confirmation and Eucharist. 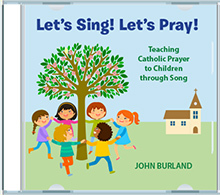 Rich in Catholic teaching and Sacred Scripture, these engaging, age-appropriate songs deepen understanding and builds knowledge of the faith for children and their families. Listen to your FREE Music Samples NOW! 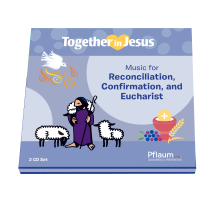 Here are the song lyrics for the new Together in Jesus music collection for Reconciliation, Confirmation, and Eucharist, featuring songs by well-known Catholic composer John Burland. Buy the 2-CD set here. Songs are in three formats: Traditional–A formal version of the prayer with organ or unaccompanied voice. Echo–A call and response version of the prayer. Contemporary–A musically appropriate & respectful version of the prayer presented in a modern popular style. This DVD demonstrates the accompanying movements to all 25 songs, and includes the words clearly displayed karaoke style for each song.